New book, 64 pages, FOR055. In the early 12th century AD a large area of present-day France was not under the direct control of the French king. In fact, the French king's direct authority stretched little further than Paris and the area immediately around it, the Ile de France. Many of the other regions were semi-independent duchies and counties, controlled by, amongst others, the King of England and the Holy Roman Emperor. One such area free from direct French control was the Languedoc, the area stretching from the Massif Central south to the Pyrenees, and as far as the river Rhone to the east. This area was under the loose overlordship of the counts of Toulouse, and by the beginning of the 12th century the whole region had become the centre of an early form of Protestantism called Catharism that flourished to an extraordinary degree and threatened the rule of the Roman Catholic Church. Pope Innocent III, alarmed at this heresy and the unwillingness of the southern nobility to do much to uproot it, launched a crusade in 1209 against European Christians. The crusading army, represented the established Church consisting predominatly of northern French knights. They saw this as an opportunity both to 'take the cross' and to obtain new lands and wealth for themselves more conveniently than crusading to the Holy land. This, the Albigensian Crusade, became a brutal struggle between the north and the south of France as much as between orthodox Roman Catholic and heretic Cathar. The inhabitants of the Languedoc had always relied for their safety upon a series of strongly fortified walled cities, such as Albi, Carcassonne, B?ers, Toulouse and a large number of fortified hill-top villages and castles which dotted the countryside. 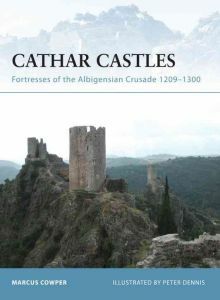 These so-called 'Cathar Castles' now became the last refuge against the invading crusaders and the conflict developed into a series of protracted and bloody sieges that lasted for over 30 years. The author describes these two very different types of fortification, the walled city and the hill-top castle. He explains why they were positioned where they were, how they were built, and the defensive principles behind their construction, and also reviews how well they withstood the test of the Albigensian Crusade.